In the month of October, Simpleview launched five extensive redesigns for clients in varying parts of the United States. From Anchorage down to Fort Lauderdale, all of the websites were built using features that showcase each destination for the optimal visitor experience. 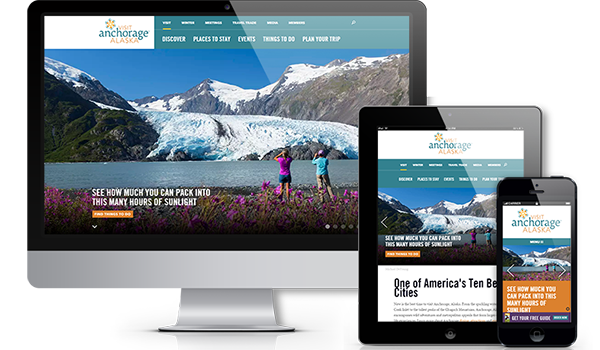 Take a look at the new Simpleview design for anchorage.net, your digital gateway to one of Outside Magazine&apos;s Ten Best U.S. Cities! With this new and responsive layout, visitors can get the most out of the listings feature with filtering options to narrow down their search. With the use of large imagery in the listings and throughout interior pages, decisions are easily made while on the road. The incorporation of TripAdvisor reviews for local attractions and transport is a sure way to determine the unique needs of each potential visitor. 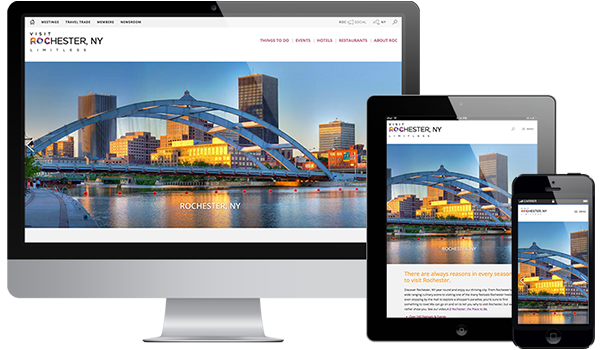 Visit Rochester&apos;s new website is a responsive and collaborative design that was built using the new Simpleview CMS. Part of the redesign goal was to merge the convention services site with the main visitor site for better access. This is easily achieved when a visitor selects "Meetings" from the main navigation, updating to the conventions services portion of the site. Convention services and the CVB are also showcased with the new blog initiative that can be found on the right side of the pages. Also included on all pages is a static map, to show site visitors where destinations are located. 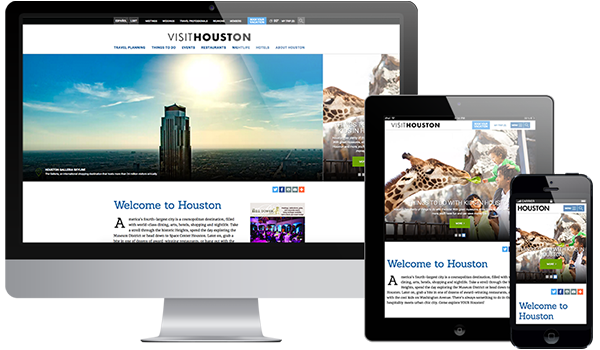 Right off the bat, the new Visit Houston website displays a unique layout with its homepage header, which features a consolidated slider on the right side of the static homepage header. Houston&apos;s Experience Builder is unique tool that combines booking, listing and an in itinerary builder into one centralized tool. The "Ask Veronica" module is a fun take on an Ask An Expert module, which is a cool way to get visitors engaged while also collecting ideas for blog-like content that the DMO&apos;s audience is seeking. Dunwoody, Georgia is located just 10 miles north of Atlanta and blends big-city attractions with a local atmosphere. 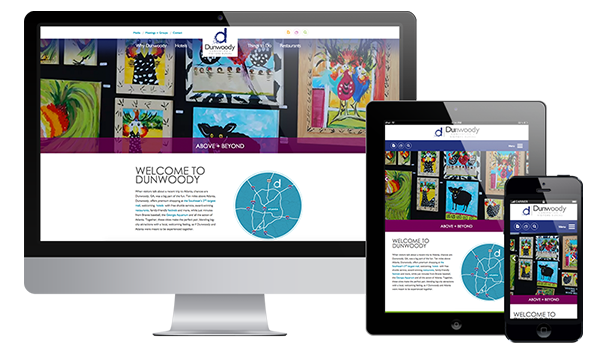 Dunwoody CVB&apos;s responsive new website, designed by Simpleview and built on the new Simpleview CMS, features a number of angles and circles throughout the new site, aligning perfectly with the DMO&apos;s "above + beyond" brand. Other notable feature include the CVB&apos;s simple but effective static map, subtly-animated buttons, and a clean-cut footer. Sunny.org is a powerful example of the use of video in modern online marketing. With Greater Fort Lauderdale&apos;s new, responsive website, full screen slides can be uploaded as images or as video, the latter of which auto-plays and truly engages and captures visitors immediately upon entering the website. For devices that struggle with auto-play video, backup header slides are swapped in to maintain a quality experience on all devices.The Sunny website also features a number of other cool features, including a customized Film page, auto-completion for search entries, and individual sliders on thumbnails for listings. Are you interested in redesigning your website, or want to learn more about the Simpleview website process? Email info@simpleviewinc.com to get in touch with an expert.